This one is for coffee lovers who enjoy the deliciously robust taste of coffee, with no distractions. Made with 100% roast & ground Arabica beans, our Unsweetened Latte Macchiato pod coffee has no added sugar* and is a lovely alternative to our standard Latte. Yummy. As well as tasting brilliant, our Unsweetened Latte Macchiato coffee pod drinks look just as good as our other latte pod coffee varieties. With irresistible looking layers that give that coffee shop quality style, and topped with soft, velvety foam, these lovely lattes definitely have that ‘wow factor’. And thanks to the maximum 15-bar pump pressure in our coffee machines, your Unsweetened Latte Macchiato pod drinks are also topped with a signature dot of crema – a delicious finishing touch. Great for little breaks throughout the day, or enjoyed whilst catching up with friends, these showstoppers are a great conversation starter. We think they’re best served in our of our elegantly designed latte glasses, which show off the your latte’s layers at their very best. And if you’re a fan of our Unsweetened Latte Macchiato pod coffee variety, you might enjoy our Skinny Latte Macchiato… for all of the taste at 50 calories per cup! Roast and Ground Coffee and Whole Milk Powder. Whole Milk Powder, Emulsifier (Soya Lecithin). 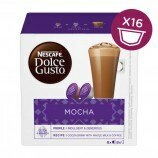 Apparently still the same Macchiato ,but not to me ,as a diabetic thought great unsweetened !! But found too be far to milky infact it was like drinking cup of hot milk ,no real coffee taste ,very disappointed ,to me not up to Nescafé usual standard ,have tried 2 coffee and1 milk but still not palatable ,sorry !! I'm sorry these are too sweet for you. After finding the regular latte sweet but acceptable I had high hopes that this would provide more of a coffee flavour. To a point it does but it is let down by the milk. The milk tastes 'off' and I just could not finish the cup. I cannot recommend this latte but suggest you try the regular one instead. If this coffee is billed as unsweetened, why is there 27.6g of sugar per 100g? The normal version only has 32.8g. Are your coffees barred from those people with diabetes who would like to consciously choose unsweetened drinks? Just wish it came decaffeinated but then would drink more probably not such a good idea with recent 10% price rise. Great taste but 10% price rise making them harder to swallow.